Industries are converging. Boundaries are blurring. Traditional competitors are reinventing themselves. We are changing how we create, collaborate, analyze, and engage. IBM is a leader in this global transformation, and there is no better place to launch or further your career. IBM Global Business Services is a leader in global transformation, and there is no better place to launch or further your career. World-class learning opportunities, mentoring and a flexible work environment -- you will find a wealth of opportunities within IBM to create the career you’ve always imagined. Essential in your leadership and dedication to building valuable client relationships with groundbreaking work. Essential in uncovering what’s possible and helping global clients succeed. Join nearly 375,000 passionate IBMers across 170 countries, supported through innovative thought leadership, plentiful training and career opportunities, and localized networks. You can learn more about IBM's latest partnerships and acquisitions on the Selected Acquisitions page. Interested in working on some of the world's most challenging problems? 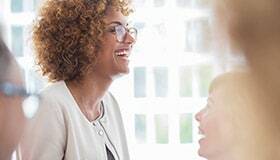 Take the first step by joining our talent community - a network of consulting professionals interested in challenging, rewarding opportunities offered by IBM Global Business Services. Take a minute to join and stay connected with us and our opportunities! Get started today on the path to a rewarding career with IBM Services. Put your talents to work and become a guiding force in the global Digital Reinvention™ of business.